Featuring the American soprano Reneé Fleming in divine form, this excellent DVD of Verdi's La traviata is sure to beat off the winter blues. With stiff competition from earlier recordings in the catalogue, one might not think there was a need for yet another. 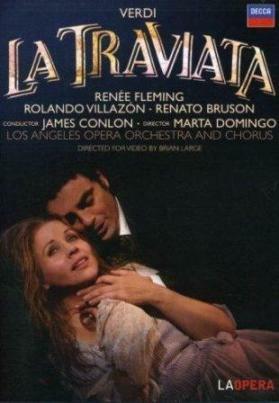 Yet Fleming's strong track record in Verdian repertoire (she is also an excellent Amelia Grimaldi and Desdemona) continues with this new release, documenting her portrayal of Violetta at the Los Angeles Opera in 2006. For me, her voice is particularly suited to works by nineteenth-century composers such as Tchaikovsky and Verdi, who wrote with a sense of classical line and sensitive orchestration yet infused their music with potent drama. Fleming doesn't always convince me in Mozart and especially Handel, where a more fluid and less mannered approach is required in some of the legato passages, but here in Verdi the mixture of a beautiful sound with a highly developed dramatic instinct - both in the acting and in the voice -is rarely less than compelling. To my surprise, Fleming's voice is warmed up right from the start ('Flora, amici') and the love duet is very secure. The cantabile of the Act I aria is sung with an exquisite legato and the soprano is always careful to underline the text in the tempo di mezzo. For me the surprise is the cabaletta ('Sempre libera'), because the detail of the high coloratura is all there - something I found lacking in Fleming's performance of Thais at Covent Garden this year - even if this is still not the most comfortable part of the opera for her. 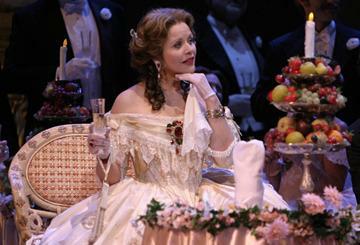 With that past, Fleming is entirely in her element: sparks fly during the encounter with the elder Germont and she maintains a touching dignity (despite one or two strange gestures in the production), while 'Addio, del passato' and the death scene in Act III are sung with undeniable passion. Perhaps Violetta's gorgeous line in the Act II concertato finale doesn't soar quite as it might in Fleming's performance here, but in truth I have no significant reservations about the soprano's striking rendition of the part. As Alfredo Germont, Rolando Villazón is surely the ideal partner for Fleming. His performance is in every way superior to that in the Salzburg Festival DVD on Deutsche Grammophon from the previous year (opposite Anna Netrebko's Violetta). It helps, no doubt, that he's not struggling against Willy Decker's nonsensical Salzburg production, but in this Los Angeles version his voice simply seems richer and his phrasing and attention to detail are much more refined. I've long felt that the cabaletta to Alfredo's Act II aria ('O mio rimorso') gets a much harder press than it deserves - Verdi employs a vigorous conventional procedure quite deliberately to convey the character's emotional turmoil - and Villazón's psychologically aware rendition might well help to turn the tide in its favour. The tenor is always at home in leading dramatic roles and his ardent tone and handsome Latin appearance make his Alfredo a creation to treasure. It's always a pleasure to see Renato Bruson in action in a Verdi role, and although his seventy years have undeniably taken their toll on his lyrical singing, for me it actually enhances the verisimilitude of the drama in his scenes as Giorgio Germont. He communicates his social position and initial disdain for Violetta's life with hauteur and carefully thinks through every line of his manipulation of her during their duet. One could easily point to more beautifully sung recordings of 'Di provenza il mar', and the opera would have been very different had Dmitri Hvorostovsky not withdrawn from the performances, but for me the emotional quality of Bruson's performance is second to none. The smaller character roles are noticeably well performed; especial praise to Anna Alkhimova's sympathetic Annina and Philip Kraus's masculine Baron Douphol, and Suzanna Guzman (Flora), James Creswell (Dottore Grenvil) and Daniel Montenegro (Gastone) complete a fine team. The Los Angeles Opera Chorus sings superbly under Chorus Master William Vendice. However, I was disappointed with James Conlon's conducting, which is nowhere near as stylish, exciting or insightful as that of Sir Georg Solti on the previous Decca DVD from Covent Garden in 1994. Some might be tempted to think that the fussy rubati and often quite slow tempi are signs of a conductor who likes to indulge the singers, but for me Conlon just doesn't control the performance enough. The Los Angeles Opera Orchestra plays well enough but without enough intensity for this searing score. This is particularly the case in the concertato finale at the end of the second act, where there isn't enough tension and shock at Alfredo's behaviour. I also feel that Solti has a greater sense of the classical lines of the orchestral writing than does Conlon, especially in the chamber-like writing of the third act. Nevertheless, Conlon really does seem to care about the singers and never gets in their way to the extent of hijacking the performance. The director of this production is Marta Domingo, wife of the great tenor Placido Domingo, who is the General Director of the Washington Opera. Her production is entirely traditional with the exception of the final scene, when a black figure in a cloak comes to lay Violetta on her bed to represent the arrival of death (which some people might find risible but I rather liked). A traditional approach doesn't have to equate to mindlessness, however, and here there are some nice touches, such as the staging of the first act in some sort of garden space, making the fact that Violetta can hear Alfredo's offstage lines in 'Sempre libera' more credible than is sometimes the case. In general the singers act with vivid facial expressions, so this is an engaging experience on the small screen. Giovanni Agostinucci's sets aren't the most amazing in the world but they serve their purpose, which is to facilitate a focussed musical performance. Overall, a rewarding addition to the catalogue.